"Layette" is a delightful assortment of clothes and articles for baby's first few months. 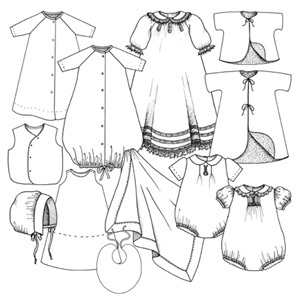 This incredible collection includes patterns and instructions for making two day-gowns, a sleeper, sacque, kimono, cap, diaper shirt, pleated front romper, smocked front romper, slip, bib and blanket. Two size groups, 0-3 months, and 3 to 6 months, are included in one pattern. 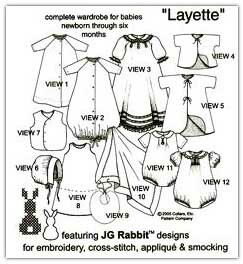 "Layette" introduces JG Rabbit� designs for embroidery, smocking, cross-stitch, and appliqué. Use these designs to embellish any or all of your creations for boy or girl babies. This pattern uses flannel or cotton type fabrics so it is nice for those who don't like working with stretch knit fabrics!